For many anglers, spring crappie fishing is the single best way to open the new fishing season. As soon as winter has released its icy grip on the frozen lakes in my region, you can bet that I store my ice fishing gear, grab a long rod, and head for the first open water that appears. Early season bluegill, bass, and pike are looking for warming water and offer plenty of action. But it is an especially great time to be a crappie angler. Early spring is a great time to catch some really big crappies. Female pre-spawn and spawning crappie are heavy with eggs and are usually easily catchable, if you can locate them. Fortunately, locating fish at this time of year isn't too difficult. Crappies begin moving into shallow water spawning areas early, even while there's still ice on many lakes. Locating them should be a fairly simple matter. These are the things to observe, keep in mind, and practice if you're looking to capitalize on some great spring crappie fishing. Water temperature is a key that can help you find schools of crappie. Look for bays, coves, and creek channel areas that catch and hold a lot of sunlight. Sunny days abound in the spring and one half-day of sunshine can warm the water enough to trigger some intense crappie activity. Small differences in water temperature can be pivotal. If you locate a temperature anomaly, say a hump or submerged tree that's 53 degrees F while the rest of the bay is 51, you may have just found the magnet for every crappie around. Three to 12 feet of water is a good bet for spring crappie. They can be anywhere in the water column, either near the bottom or higher up. If you've got clear water, you may even be able to visually sight crappies if they're holding shallow. I like to cast hard baits to locate crappies, before switching to small jigs, soft plastics, or minnows. It's effective and it just feels so good to cast a long rod again after jigging with short rods on the ice all winter. Beetle Spins, Rooster Tails, Mepps and other inline spinners, small Rapalas or Rapala-like crankbaits are great locating lures. If I need these small lures to run a bit deeper I will simply pinch a small split shot or two a foot or so from the lure. When I fish spinners, I like to add a short wire leader to my line. This helps to eliminate line twist and offers a little extra insurance against losing a lure should a northern pike take a swipe at it, which happens often enough. I also especially like Rapala's 2 3/4-inch Balsa Xtreme Minnow in silver, smelt, and blue pearl colors for fishing fairly shallow. This sleek little crappie-catching lure will run down to around four or five feet, and a little deeper with a single small split shot added a foot or two up the line. When locating crappies, I'll usually fish a heavier line than I would after locating a school. I prefer 8- or 10-pound monofilament, but will occasionally switch to a jigging rod rigged with fluorocarbon. If I am using fluorocarbon I can often eliminate the split shot since the line itself is heavier than mono, even in a lighter pound test. Once I've caught a crappie or two with a locator lure, I'll often anchor my boat and start tossing a small, slow-sinking jig. Generally speaking, I like 1/16-ounce (occasionally a 1/32-ounce) white marabou jig, with a little silver and red mixed in. These small jigs sink slowly, giving schooled crappies plenty of opportunity to see it fall. 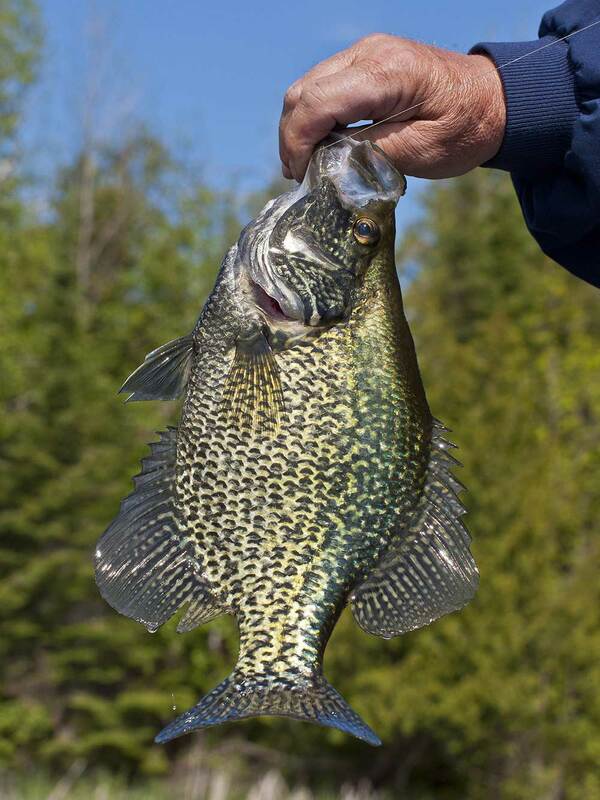 Crappies will readily swim up to hit a lure, but if your lure or bait drops below where they're suspended you'll have a harder time eliciting a bite. For whatever reason they don't seem to like going down to bite. I'm not a stickler when it comes to crappie jigs. A simple, inexpensive round jig head in the right weight is good enough to get the job done. Attach a small soft plastic grub trailer if the crappie bite is good, or a live minnow if they need a little coaxing. Which brings up a good point about live bait. You should always have some crappie minnows in the boat. You may not need them, but it's always better to have them and not need them than to wish you had them. Crappies can rarely resist hitting a live minnow, even when the bite is sluggish. At times when catching crappie is a challenge, tossing a minnow on nothing more than a bare hook under a slip bobber can make all the difference. I usually have several fishing rods rigged differently and ready to go, so that I can quickly adapt and grab whatever setup seems appropriate for the conditions. If you're fishing in a brush pile, the minnow and slip bobber setup will work nicely, as will mostly vertical jigging if you're prepared to deal with the occasional snag. If you do get snagged, don't ruin your spot by overworking your line to try to unsnag it. If it looks like you're solidly snagged, gently pull the line until it breaks and tie on a new jig or hook. Better to lose a jig than lose the school and the bite. As the water continues to quickly warm in early spring, you may find yourself going from a pre-spawn to spawning situation. Male crappie move into shallower spawning areas before the females, and are very aggressive. They'll attack most anything that ventures into their space, including your lures. They do it not out of a desire to feed, but rather to protect their spawning ground. This is probably the single most exciting time to catch crappies. But you've got to be wary, because while the fish are shallow and aggressive, they are also easily spooked. Good boat handling is a must. I am not one to tell other anglers what they should or shouldn't do. You paid for a fishing license, so you can do whatever you want with the fish you catch, as long as you're within the boundaries of your state regulations. But if you do get into a school of aggressive, spawning crappie, you might consider releasing most or all spawning females and only keep the males for a meal. If you catch a true monster, then you've got to decide whether to keep it for mounting, or take some measurements and have a replica made and then release it. Of course, you should take plenty of photographs whatever you choose. Just be sure to practice proper handling techniques and minimize stress on the fish as much as possible. Crappie bag limits are generally pretty handsome, and if enough anglers take advantage of the ability to indiscriminately keep everything they catch, crappie populations and the size of individual fish can indeed suffer. It's something to consider if you want to keep catching big crappie in the same place for years to come.